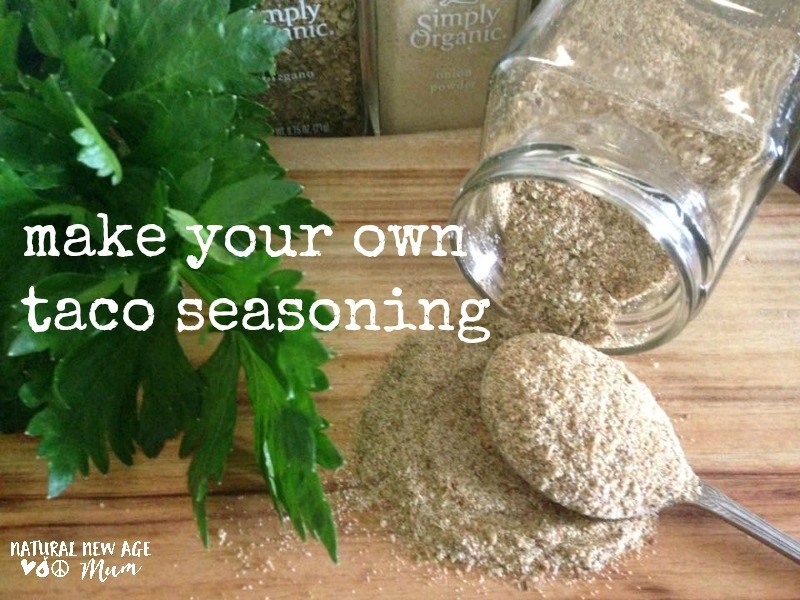 Make your own additive free taco seasoning!! I did a quick look at the packet taco seasoning today at the supermarket and was sad to see that the first ingredient (that means it has the highest percentage) is either salt or sugar (white and refined). The kids always go back for seconds – that’s normally a good sign, right? I like to use organic spices and herbs for this – Simply Organic or Gourmet Organic are my favourite brands. Mix all the ingredients together. Easy huh? 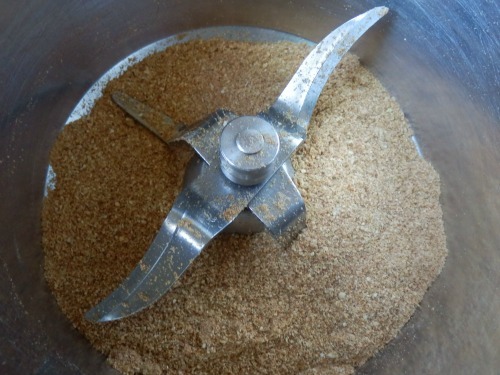 If you have onion flakes you may want to grind to a powder. You can do this by hand with a mortar and pestle or with your food processor. If you are lucky enough to have a thermomix, then grind on speed 10 for 10 seconds. That’s it. Now you can store the seasoning in an airtight container or use it straight away. You could make a double batch and have some for next time. You could make lots of batches and give it away as gifts ! ♥ Make taco mince using 500g mince and one batch of this seasoning. ♥ Rub it into a shoulder of pork and throw into the slow cooker for a delicious Mexican Pulled Pork. ♥ Fry with some strips of chicken, onion and capsicum to make fajitas. ♥ Rub it on a whole chook or chicken pieces and make my Mexican Chicken. ♥ Sprinkle on baked potato wedges and serve with sour cream and guacamole. ♥ Add to mince and shape into hamburgers. Serve in a bun or soft tortillas. ♥ Toss through a drained can of chickpeas and some oil and roast in the oven until crispy. ♥ Liven up a beans and rice dish. ♥ Add to mayo or sour cream to make a tasty dressing. This is fantastic, thanks so much for posting! I’ve only just started label reading and it’s really rather horrifying! it sure is! I use the Chemical Maze handbook a lot, but basically if it has numbers, I avoid it! Great recipe!!!! Made it for dinner tonight an it was a huge hit!! Thanks! thanks for that Megz ! Thankyou just the recipe (Natural New Age Mum your a gem! )I have been looking for! I found Mission Taco Shells at our local Coles they only have Cirn Flour, Vegetable Oil and Water so we are ready to go! Cooking now smells great!!! I was using Mission brand corn tortillas but my local Woolworths have stopped stocking them. On my next trip to Melbourne I am going to buy a tortilla press and some Masa Corn flour to make my own. Ingredients: Masa Corn flour (white, yellow or blue) and warm water. thanks for the great recipe, will certainly be trying that out, expecially once I get my new Thermomix that I just ordered yesterday! I get Old El Paso shells, and after reading this blog thought I would check out their ingrediants. States low in salt – 200mg/100mg shells. Only additives are 304 and 306, which are antioxidents and when I looked these up they sound harmless. Other ingreds are ground corn, sunflower oil, water and salt. Are there any that are better than that? I made Tacos tonight, with a new difference. Rump Steak, slow cooked all day, with an onion, garlic, kidney beans, a little stock, and seasoning (packet, that’s why I’m here, remembered seeing your recipe, I want to make my own next time). But, oh-my-goddess! Delicious, all stringy, and like authentic Mexican! Won’t be able to go back to mince now! thanks Suzy… that sounds yummo 🙂 did you have the steak in strips or whole when you slow cooked it? Thank you SO much for the taco seasoning recipe! Tacos are one of a few good meals that my kids (5 & 8) devour! I have been using Mission brand as it’s gluten free but would rather make my own seasoning. I always put grated zucchini and carrot in any mince dish I make. Any ideas on the Taco sauce recipe? I just made a bunch of taco sauce with chipotle powder instead of cayenne. It’s takes it to a level where my tacos are now addictive. I also use mushroom oyster sauce in place of the sugar and salt. I use kidney beans and a tin of tomatoes instead of meat too. OH wow. I am gonna have to try this. We love Tacos. It is our go to easy meal (along with Spag Bolg). I made lettuce leaf tacos tonight – using your taco seasoning mix! I cant have onion, so left that out! But yummo! I have a thermomix, so wondering if you have tried cooking the meat etc in the TM?? Hi thanks for this recipe! My family loves Mexican night and tacos are a big fav with the kids. I must admit last time we had it the kids got really hypo maybe because of the additives so I will be def be using your recipe from now on!!! yum that would be lovely with chicken strips or even mince! Thanks Sharon – great to know!! I amg going to have to try those flatbread – they sound amazing! This is a really good additive free mexican recipe. I make our family’s mexican wrap fillings with paprika, cumin and garlic. Thanks for the tip on Sorj! Tacos are one of our favs too! Look forward to trying on the weekend and I’m pretty sure I have all the ingredients which is a bonus! I use this recipe from the forums to make salsa to go on our tacos – http://www.forumthermomix.com/index.php?topic=7877.0 I substitute the basil for coriander (I always have cubes of coriander in the freezer for adding to cooking). This recipe is utterly delicious and now I have Mexican seasoning for my mince/beans. Thank you! no problem – let me know how you go Gina! G’day! Your recipe is great and LOVE is no sugar, true! HOW quickly it can be made!! it will be one of the recipes featured on my blog post today…hope you will stop by and view! Love your recipes, they are so yummy. My son has a number of allergies and is on a low fodmap diet. If I was to omit the garlic and onion from the taco seasoning do you think it would still be tasty enough? 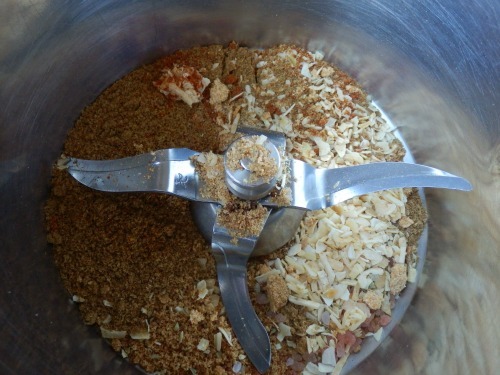 My husband and I LOVE this taco seasoning and have been making it in a food processor. But now I have my Thermomix and it’s so much easier! Can you cook the taco mince and vegetables in the Thermomix Sonya? Great recipe. Are your measurements metric measuring spoons. Just trying to make a bulk batch and get the maths right. Thanks. Yeh! Mission brand regular taco shells have the following ingredients… Corn flour, vegetable oil amd water. That’s it!! Yeh! That’s getting better! Vege oil is usually canola but it’s getting there!